The high court in the Indian state of Gujarat has ordered the government to lift the ban on a controversial book on Pakistan's founder Mohammed Ali Jinnah. 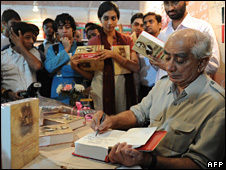 The book was written by Jaswant Singh, a leader in India's Hindu nationalist main opposition party, the BJP. The party subsequently expelled him. But two social activists from Gujarat challenged the ban in court. The state government said it had banned the book for "defamatory references" to India's first home minister. India's first home minister, Vallabhbhai Patel, is a political icon in his home state of Gujarat. 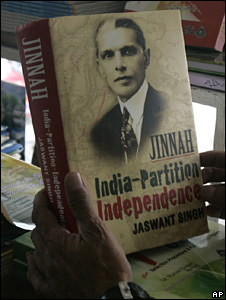 While banning the book last month, the Gujarat government had said that Mr Singh's book Jinnah: India-Partition-Independence was "objectionable, misleading and against public tranquillity". But the Gujarat high court said on Friday that the government had not "read the book" before imposing the ban. The court said the government had not "applied its mind" to arrive at the opinion that the book was "against national interest" and would affect public peace. The Gujarat government is expected to issue a statement reacting to the court decision. It is not clear whether it will issue a fresh ban giving a different reasons. Mr Singh welcomed the decision and said: "I am thrilled". He has filed a separate case in the Supreme Court challenging the ban. The book examines the role of Congress party leader and the country's first Prime Minister, Jawaharlal Nehru, and Mr Patel in the partition of India in 1947. Mr Singh writes that Mr Patel was "far off the mark" in many ways with his projections about the division and future of India. Jaswant Singh is a 71-year-old party veteran who has served as finance and external affairs minister in BJP cabinets.